Since the XVI century plenty of prints have represented cats, generally together with other people, more rarely represented alone. 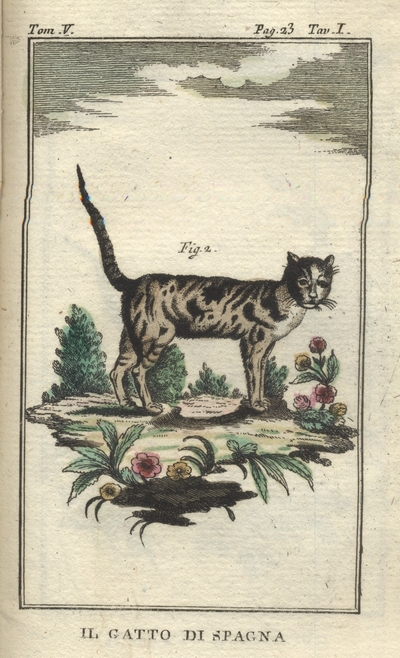 One of the most interesting in this section is the the unusual portrait of an Albanian Dgi -Guerdgi while feeding cats in Constantinople Bazaar: The work is taken from a "Collection of a hundred prints representing different Oriental nations" published in Paris in 1714. Many more prints complete this interesting section, together with the Remondini's cat from Bassano, the representations alluding to the Russian Tzar and the prints taken from Buffon's "Natural History".